When it comes to restaurants there is no shortage of variety in Mammoth Lakes. We have our favorites, but as most of the restaurants have gone online, the variety is limitless. 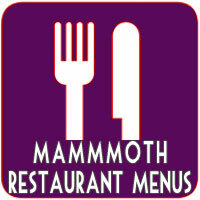 Here are the menus from the local Mammoth Lakes restaurants. Check back often as we get coupons, special dinner party events and prix fix menu items. Ask us to send you our latest to compliment the restaurant menu guide book called the Sierra Dining Guide. If you don't feel like eating out, you can have the food delivered to your door from our friends at Door Step Diners.